Previous Clean Driver versions can be downloaded - Here. What is a Clean Driver? Clean version of 425.31 x64 drivers for Win 10, 8.1, 8, 7 x64. -It is Highly recommended to use DDU prior to new clean driver installation. Note: Latest DDU requires you to Disable your internet connection prior to its usage, once a driver is installed re-enable it. Optional GeForce Experience: If you wish to install GeForce Experience, the latest Official Nvidia version can be found Here. Simply install it after you finalize driver installation. + Small tweak to Remove GFE Mandatory Login/Telemetry. Don't want to wait? Need to clean up an older driver? Or perhaps you simply want to do it Yourself? 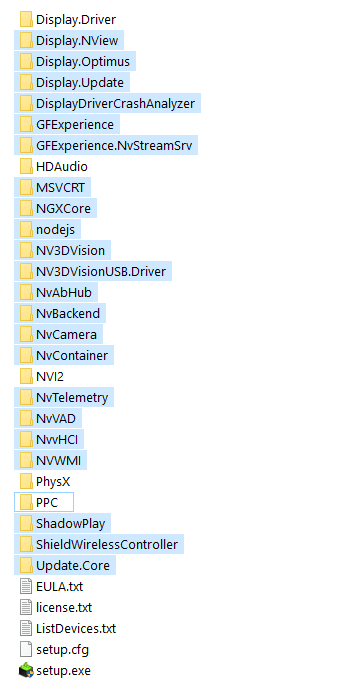 A) NVSlimmer developed by @uKER which allows you to quickly clean a Nvidia driver. B) A short step-by-step guide explaining how the whole cleaning process is done. It's really simple and takes only a couple of minutes. Download the latest Official Driver. Once extracted, the following highlighted folders can be deleted. FOR RTX CARDS - Kudos to @VolterMort for testing - Additionally keep NGXCore + PPC folders. Your driver is clean now, run setup.exe and you are done. This simple process will keep your system free of unnecessary Nvidia driver bloatware. desmonds99, alexander1986, somemadcaaant and 37 others like this. That's for manual installation, but afaik it installs automatically with whole pack. 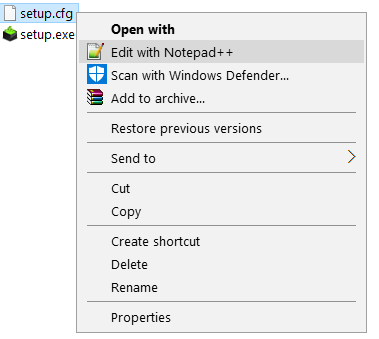 That's how it should be, as it installs .dll files into Windows folders. 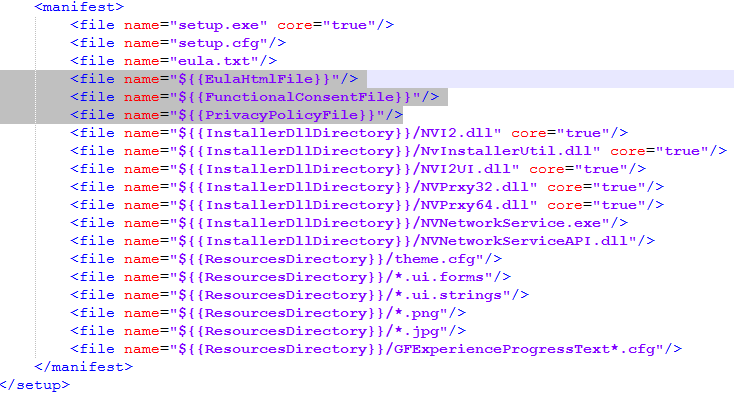 Go to C:\Windows\SysWOW64 and you will see Vulcan files there. Why do you remove the audio driver? It's not "crap" at all. The default Windows driver severely reduces the functionality of the integrated audio device (compared to the nVidia driver). It's almost like using the default driver of Windows for the graphics (you do get picture but it's not what you paid for...). Check the first comment, updated. Personally, don't use it as I have a sound card, but there you go. mapnam charun and janos666 like this. I assume the Audio Driver are necessary when you connect the computer to your TV through HDMI? I assume the Audio Driver is necessary when you connect the computer to your TV through HDMI? It's necessary if you want to output audio via this HDMI connection. mapnam charun and Netherwind like this. Well, not entirely. The default Windows driver offers some basic functionality which might cover the needs of some people (it's plenty enough to have "some" sound on the TV speakers or headphones connected to a TV) but the nVidia sound driver offers much more (supports additional PCM and pass-through formats including multi-channel hi-res formats for AVRs). If you have an HDMI AVR, I would definitely consider this driver a bare necessity (otherwise you cripple the sound compared to what you paid for). These are fantastic drivers for my 1080ti! Thx very much for posting them for d/l! Clean version of 398.11 x64 driver. At last someone... Big thanks. Will wait new versions from you. Forgot to mention this is for Win10. Updated, now there are two version, both win 10, and 8.1, 8, 7. Both versions include optional HD Audio. Netherwind, mapnam charun and Angantyr like this.